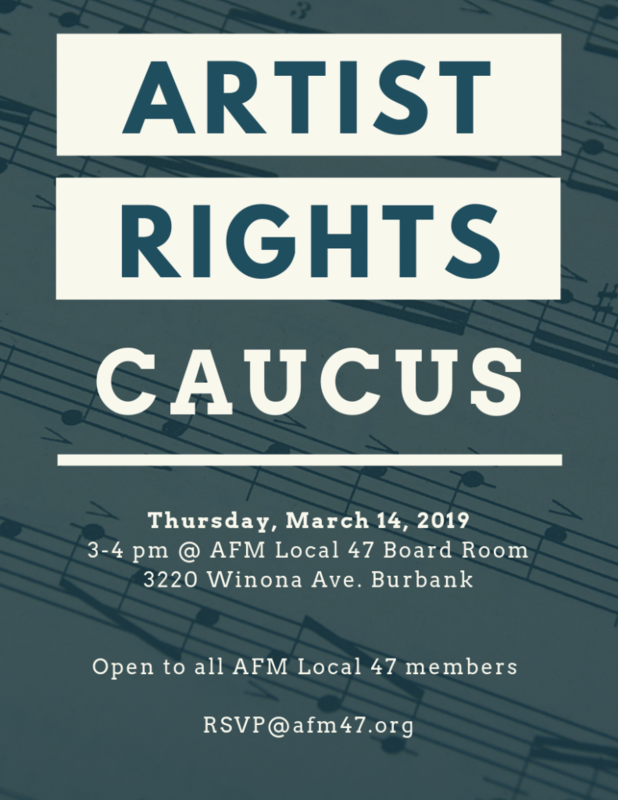 Marc Ribot, guitarist and chair of the Artist Rights Caucus (ARC) of NYC Local 802, will discuss recent developments. The RMA supports ARC 802’s call for a campaign to reform the Section 512 “Safe Harbors”, which permit YouTube, et al. to profit from mass infringement. And the new Local 802 Administration “supports the tenets outlined in [the ARC] call to action” for “Safe Harbor” reform (source). The Artist Rights Alliance (formerly c3) is now building towards a campaign. But we’re going to need the active involvement of all AFM musicians and Locals to make this happen. WE WELCOME CRITIQUE, QUESTIONS, AND IDEAS FROM ALL LOCAL 47 MEMBERS! I tried to RSVP for Thursday’s Artist Caucus Meeting 3pm March 14th, however it didn’t go through. Hi Eric – thanks for the message! We’ve got you down as confirmed. See you on the 14th!